getting salon hair at home is now more accessible than ever. great products at affordable prices can now be found at nearby drugstores, tutorials and information on how to achieve gorgeous hairstyles are just a click away (take a look at my sidebar!) and being your own stylist can be achieved in just moments. 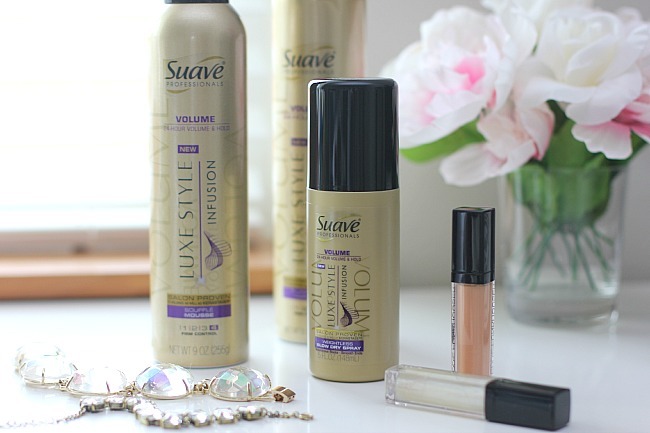 thanks to the new Suave Professionals® Luxe Style Infusion products you can afford products that work as well as a top salon brand. for how-to videos on how to get curls, volume or smooth hair at home click here. with summer approaching these products are a must. heat and humidity have a tendency to wreak havoc on your hair so you will need a good arsenal of products to get it under control. be sure to check out below for more information on the products.